Ethan can be forgiven, I think, in view of the fact the Comanches killed his mother. I think he also had more than a casual interest in his sister-in-law. A century and a half have passed since the era potrayed in the movie and attitudes have changed completely, but I think even in this enlightened age your man on the street could be driven to rage if faced with the same circumstances. A good review of a great movie; not the western I watch the most but probably the one I like the best. The acting was great and the cinematography even better. Yes, watching this one at home I definitely felt I was missing something. Those western vistas demand a big screen. On Martha and Ethan, I read the suggestion somewhere that Debbie might had been his daughter. You mention the “oft-imitated” shot (of Ethan standing in the door frame). 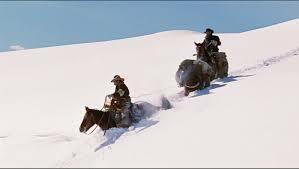 Lawrence Kasdan definitely makes use of it, near the beginning of his movie “Silverado.” However, his lead character (played by Scott Glenn) walks on out, eager to take up life once again as a free man (after having spent five years in prison). Unlike Ethan, he has something to live for, other than revenge. At any rate, the striking panoramic view he finds after leaving the door frame is breathtaking in its beauty. 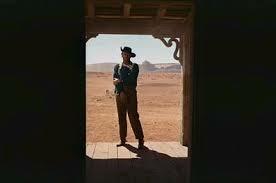 Bravo John Ford (for cultivating such mesmerizing artistic inclinations)! I didn’t know about that one, Tiziana. It’s kind of nice, that Kasdan took it as a jumping off point. The list of imitators just goes on and on, doesn’t it? Whoa!…..sounds like you’re saying Ethan is a progenitor of Clint Eastwood’s Dirty Harry. All that talk about frontier justice and being an anachronism. Just saw Dirty Harry the other night in “The Enforcer.” Heard Harry being berated like that. Well, I wasn’t saying it, but if the shoe fits . . .
Ah!….the silence speaks volumes. Far too few people, especially among actors, appreciate the power of silence. Glad you highlighted how Ethan didn’t have to finish his statement “…till she’s of an age to….” in order for viewers to comprehend fully what he meant. Time and again, Ethan’s voice trails off, but leaves not doubt as to his meaning. That’s the beauty of Wayne’s laconic style, I suppose. We’re drawn in, maybe despite ourselves in the case of a character like Ethan. Finishing those sentences of his makes us participants, not simply observers. Thanks for this insight, Harriet. All filmmakers should take note of the family-gathering-around-the-table scene in the movie. There are no cuts in it! Quite an achievement, getting so many actors to be involved in so much action all at once AND the director managing to get it all on film without any cuts. True artistry! I hadn’t noticed that, Francesca. Thanks for pointing it out!